The value of social media in crisis communications was reinforced in the past two weeks to organizations on the front lines of Hurricane Sandy. The value of social media in crisis communications was reinforced in the past two weeks to organizations on the front lines of Hurricane Sandy, many of which saw the number of their Facebook fans and Twitter followers increase by the thousands. 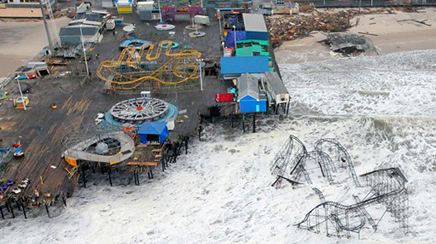 The reason: many consumers in New York, New Jersey, and Connecticut relied on mobile and tablet devices to receive important information during the Hurricane and its aftermath. Before Sandy approached the East Coast, Con Edison had about 1,000 Twitter followers; now the utility company has more than 22,000. New York City's Metropolitan Transportation Authority, which runs the city's subways, buses, tunnels, and bridges, nearly tripled its audience on Twitter from 26,000 to more than 75,000 in the days after the storm. In addition to providing updates on train service, the MTA also posted images to help frustrated commuters understand the extent of the damage and what the organization was doing. “The L train in the Williamsburg neighborhood of Brooklyn was one of the last to be restored, and residents and representatives of the neighborhood were complaining, ‘Where's our L train? '” says Lisberg. “I think that went a long way to establishing our credibility,” Lisberg adds. Con Edison, about 98,000 of whose customers lost electrical power, has been under fire for prolonged outages caused by Sandy, including from a column on Time's website. On Thursday, Con Edison chairman and CEO Kevin Burke met the press at a disaster recovery center opened by FEMA, where he apologized for the delay that has left thousands without power for more than a week. Allan Drury, Con Edison's public affairs manager, tells PRWeek, “We've tried to be very clear in the dozens of interviews we've done daily and in dealing with customer inquiries that we understand the frustration. We've let them know that we've pulled every resource imaginable from across the US, with [contracted] crews coming from as far west as California, to get service restored. In addition to playing an important role in community outreach, social has also helped power companies from an employee-relations standpoint, says Theresa Gilbert, media relations specialist and social media coordinator of Connecticut Light & Power. More than 850,000 of its customers lost power during the storm. A dedicated communications team of about a dozen staffers posted daily progress reports and safety messages on Twitter and Facebook, where employees also responded to customer concerns. In addition, CL&P had a production team shoot video of clean-up efforts and post the footage on its YouTube channel. Reporters were also invited behind the scenes of its restoration efforts. CL&P also fostered a sense of community by posting content on Facebook, including a photograph of a utility crew with a young boy who had dropped by a staging area to give a team Halloween candy. The post generated more than 800 likes “and proved very morale-building for our employees,” says Gilbert. Some brands helped consumers during the crisis, while companies such as the Gap and American Apparel were criticized for what looked like crass attempts to profit from a natural disaster. Duracell, which deployed its “Rapid Responder” truck to hard-hit areas in New York and New Jersey to help residents charge phones and computers and get Internet access, was praised for its efforts. The company made the truck's schedule and location public on Facebook and Twitter, and it worked with agency Citizen Paine on media outreach, says Will Sakdinan, global communications associate director for Procter & Gamble-owned Duracell.